It happens every June and I try always to be there. For the past few years it has found the perfect home at ICE (the Institute for Culinary Education) on 23rd Street in New York City. 10 pastry chefs from around the US are honored and the invitees get to taste their desserts. 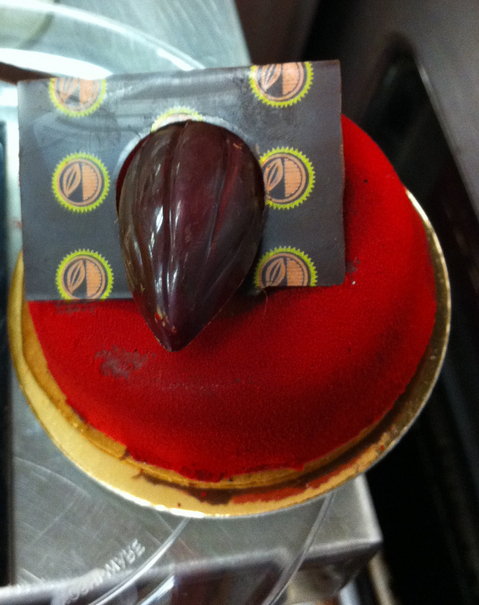 But it's not the desserts that come first for me--it's the pastry chefs--my beloved colleagues. This event provides the ideal opportunity to get to see old friends and make new ones. For the names of the honorees see the extended entry. I was so happy to see Jacquy Pfeiffer (this year's Hall of Fame Honoree) and his wife, who came in from Chicago, and get to tell them how I cried my way through his "Kings of Pastry" brilliant documentary. I got to meet Franciso Migoya from the CIA who was offering amazing chocolate mousse 'pops' containing amareni cherries and coated with white chocolate that was tinted green. Another chef, who several years ago promised to send me his Sacher Torte that he assured me was not the usual dry cake, but who had lost my card, promised again to send it to me. Yet another chef told me how he had never baked before The Cake Bible and now has a thriving bakery. (This is always music to my ears.) And what fun to run into Gilles Renusson, chairman of the Club Coupe du Monde USA and chef instructor at Grand Rapids Community College in Michigan. He remembered me but couldn't remember from where. Slowly I realized that he and I were the two guests invited by Ariane Batterberry to Michael Batterberry's birthday dinner at Auberge de Soleil in Nappa many years ago, during the pastry arts conference at the CIA. I also got to taste an excellent bittersweet chocolate from Peru accompanied by a glass of Rosa Regalé. But for me, and I tasted most everything, the most marvelous and impressive dessert came from Oscar Ortega, of Atelier Ortega in Jackson Hole, Wyoming. Maybe it's a good thing they are so far away, though they do ship. I'd be stopping by on a regular basis for their heart stopping flourless chocolate cake. The red velvet flocking, created by tinting cocoa powder and shooting it out of a spray gun, was gorgeous and aroused my curiosity. The shocking color reflected the chocolate interior that was enhanced by the fire of chipotle pepper powder--just enough to make one's mouth sing. And in the very center was a pool of cajeta caramel. The decoration in the very center on top of the caramel is chocolate in the form of a cocoa bean surrounded by a placque which, to my taste, detracts from the elegant beauty of the cake. DESSERT PROFESSIONAL MAGAZINE ANNOUNCES THE TOP TEN PASTRY CHEFS IN AMERICA At the 18th Annual Awards Ceremony On Monday, June 6th at The Institute of Culinary Education New York, NY - May, 2011 - Dessert Professional magazine, the nation's leading publication of the pastry, ice cream and chocolate industries, will name the top toques of tuile, cocoa and sugar at a ceremony on Monday, June 6 at The Institute of Culinary Education in New York. As dessert professionals have taken their rightful place as culinary luminaries, the magazine that leads the industry will honor those individuals who lead the pastry pack. "With more and more remarkable talent filling the ranks of dessert professionals, being recognized as one of best has gained a new level of prestige," notes Editor Matthew Stevens. "We set out to recognize outstanding chefs who elevate the industry as a whole with their contributions in talent, innovation, and community service. These are the chefs who have proven they most embody the spirit of excellence and hospitality that we are all committed to," said Publisher Jeff Dryfoos. Selected from around the entire country, this year's Top Ten, the crème de la crème are: Antonio Bachour - Executive Pastry Chef, Quattro at Trump Soho, New York, NY and Solea at W South Beach, Miami Heather Carlucci-Rodriguez - Pastry Chef, PRINT at the Ink Hotel, New York, NY Tariq Hanna - Pastry Chef and Owner, Sucre, New Orleans, LA Sylvain Leroy - Pastry Chef and Technical Advisor, Paris Gourmet, Carlstadt, NJ Francisco Migoya - Associate Professor, The Culinary Institute of America, Hyde Park, NY Jerome Landrieu - Pastry Chef and Director, Barry Callebaut Chocolate Academy, Chicago, IL Yoni Morales - Executive Pastry Chef, Ark Las Vegas Restaurant Corp., Las Vegas, NV Oscar Ortega - Pastry Chef and Owner, Atelier Ortega, Jackson Hole, Wyoming Ron Paprocki - Executive Pastry Chef, Gordon Ramsay at The London, New York, NY Jean-Francois Suteau - Executive Pastry Chef, The Beverly Hills Hotel, Beverly Hills, CA This year's Hall Of Fame honoree is pioneering educator and pastry industry leader, Jacquy Pfeiffer, co-founder/owner of the French Pastry School at City Colleges of Chicago in Chicago, IL. In 2009, Pastry Art & Design, Chocolatier and Frozen Desserts, the three leading magazines of the dessert industry, merged into one powerful publication, Dessert Professional. "The mission was to keep our readers informed, identify emerging trends and sharing techniques and information that help build chef's repertoires and bottom lines," notes Co-editor Tish Boyle. "We felt that by merging the magazines the whole was greater value to our readers than the sum of its parts." The event will feature a walk-around tasting of desserts from some of the most talented chefs in the nation. Dessert Professional is proud to announce that the Anita Kaufmann Foundation (AFK) has been selected as the benefiting charity for the 18th Annual Top Ten Pastry Chefs in America event. "The AFK's mission of providing free seizure awareness training to employees of restaurants, hotels, and other public venues is unique and much-needed," says editor Matthew Stevens. The Top Ten Pastry Chefs In America event will be held on Monday, June 6th, 2011 at ICE (The Institute of Culinary Education) at 50 West 23rd Street, New York, NY. Hors d'oeuvres, wine, & beer starting at 5:30 pm, awards ceremony at 6:15 pm, and dessert service to follow at 6:45 pm. 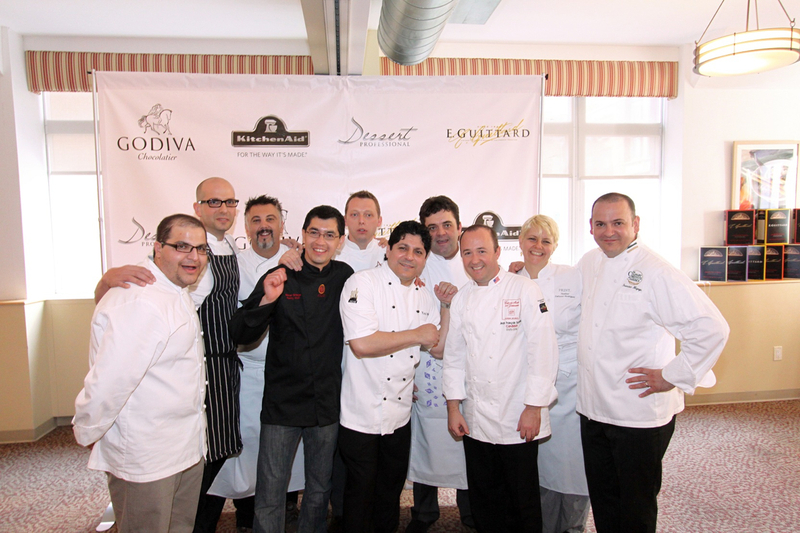 This event is graciously sponsored by Godiva Chocolatier, KitchenAid and E. Guittard Chocolate. Menu for Top Ten Pastry Chefs in America 2011 1. Antonio Bachour - Executive Pastry Chef, Quattro at Trump Soho, New York, NY and Solea at W South Beach, Miami Panna Cotta with Peach Sorbet, Morello Cherry and Peach Pearl, Cherry Gel Sheet and Cellophane of Sugar 2. Heather Carlucci-Rodriguez - Pastry Chef, PRINT at the Ink Hotel, New York, NY Chocolate Flan with Chocolate Sorbet and Preserved Black Currants 3. Tariq Hanna - Pastry Chef and Owner, Sucre, New Orleans, LA Lipstick on a Pig (A P. B. and J. Tale) 4. Sylvain Leroy - Pastry Chef and Technical Advisor, Paris Gourmet, Carlstadt, NJ Boa Vistas 5. Francisco Migoya - Associate Professor, The Culinary Institute of America, Hyde Park, NY Black Forest Pop 6. Jerome Landrieu - Pastry Chef and Director, Barry Callebaut Chocolate Academy, Chicago, IL 7. Yoni Morales - Executive Pastry Chef, Ark Las Vegas Restaurant Corp., Las Vegas, NV Mojito Cappuccinos 8. Oscar Ortega - Pastry Chef and Owner, Atelier Ortega, Jackson Hole, Wyoming Passion Fruit Cream with Hazelnut and Lemon Mousse 9. Ron Paprocki - Executive Pastry Chef, Gordon Ramsay at The London, New York, NY Valrhona Caramel Chocolate Mousse, Chocolate Sable, Milk Jam with Quark Ice Cream 10. Jean-Francois Suteau - Executive Pastry Chef, The Beverly Hills Hotel, Beverly Hills, CA Caramelia-Strawberry-Cassis This year's Hall Of Fame honoree is pioneering educator and pastry industry leader, Jacquy Pfeiffer, co-founder/owner of the French Pastry School at City Colleges of Chicago in Chicago, IL.